This is a great side dish! The recipe is taken from “The $10.00 Gourmet” by Ken Kostick. I would suggest to drain the tomatoes as the juices made the dish too watery, and when I added the cream (I used half and half) a rose sauce wasn’t made. 1. Heat the oil in a large pot and sauté the garlic and all of the vegetables for 5-6 minutes. 2. Add all of the remaining ingredients, except the cream. Bring to a boil the reduce the heat. Simmer for about 5 minutes. 3. Add the cream, mix well to a creamy texture, and serve. Garnish with cherry tomatoes, if desired. I don’t know why I make this cookie. I just ate 4 of them….sigh! 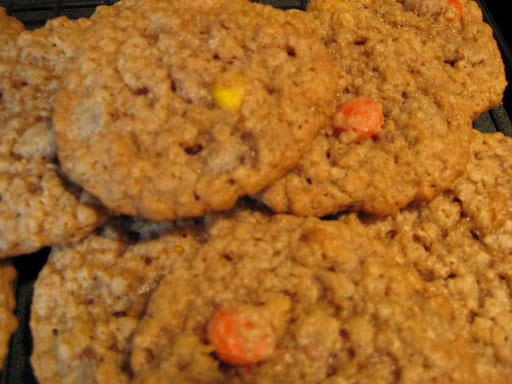 This recipe is very close to the “Monster Cookie” recipe on this blog, but I think I prefer this recipe better. (although, both are super good). This recipe is taken from Better Homes and Gardens “100 Best Cookies” magazine 2011. I bought a box of Reeses’s Pieces thinking that it would be a cup measurement inside but it only came to 1/2 a cup, so next time I make these I would buy 2 boxes. I also used the mini peanut butter cup baking pieces from SuperValu. 1. Preheat oven to 350F. In a very large bowl beat peanut butter and butter with an electric mixer on medium speed for 30 seconds. Add brown sugar and baking soda. Beat until combined, scraping side of bowl occasionally. Beat in eggs, one at a time, until combined. Beat in the vanilla. Beat in as much of the flour as you can with the mixer. Use a wooden spoon, stir in any remaining flour, oats, peanut butter pieces, and peanut butter cups. 2. Drop dough by rounded teaspoons 2 inches apart on ungreased cookie sheets. Bake for 10 to 12 minutes or until edges are light brown. Cool on cookie sheets for 3 minutes. Transfer to wire racks; cool. These cookies are so amazing! 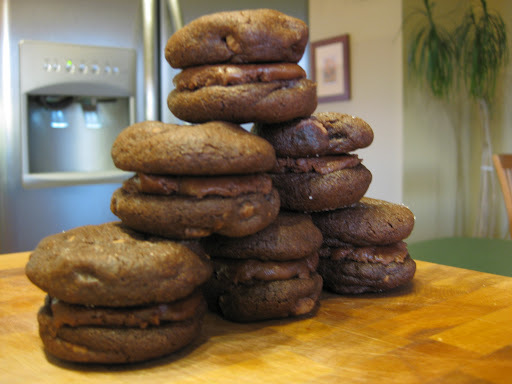 I don’t often make sandwich cookies as it’s 2 cookies that you are eating…never good for my waistline…but with this recipe I’d be willing to indulge often! This recipe was taken from Better Homes and Garden’s “100 Best Cookies” magazine 2011. I omitted the salt, since I used salted butter. I also used President Choice’s peanut butter cup baking pieces. 1. In a small bowl combine flour and cocoa powder; set aside. in a large bowl beat butter with an electric mixer on medium to high speed for 30 seconds. Add granulated sugar, brown sugar, baking soda, and salt. Beat until combined, scraping side of bowl occasionally. Beat in as much of the flour mixture as you can with the mixer. Using a wooden spoon, stir in any remaining flour mixture. Stir in the peanut butter and milk chocolate pieces. Cover and chill for 2 to 3 hours or until dough is easy to handle. 2. Preheat oven to 375F. Lightly grease cookie sheets; set aside. Shape dough into 1-inch balls. Place 2 inches apart on prepared cookie sheets. Using a glass dipped in granulated sugar, flatten cookies slightly. Bake for 7 to 8 minutes or until tops are cracked and look dry. Cool on cookie sheets for 1 minute. Transfer to wire racks;cool. TO STORE: Layer sandwich cookies between sheets of waxed paper on an airtight container;cover. Store at room temperature up to 24 hours or freeze for up to 3 months. 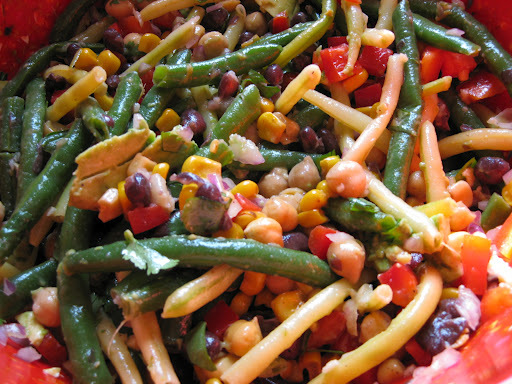 I LOVE this bean salad! It is taken from “The Complete Light Kitchen” by Rose Reisman. To make ahead, prepare dressing and salad early in the day, reserving the avocado and cilantro, and refrigerate. Add just before serving and toss with the dressing. I always use the lime in this recipe, plus I add the hot sauce and not the jalapeño. I also use frozen whole green beans if fresh isn’t available. 1. Steam the green beans just until bright green and still crisp, about 3 minutes. Place immediately under cold water and rinse until the beans are no longer warm. Place in a serving bowl. 2. Spray a small non-stick skillet with coing oil and place over medium heat. Sauté the corn, stirring frequently, until browned, approximately 8 minutes. Add to the serving bowl, along with the black beans, chickpeas, bell pepper, onion and avocado. 3. Whisk the zest, juice, oil, garlic, ginger, jalapeño, salt and pepper together in a small bowl. This recipe is taken from Cook’s Illustrated “The Best Light Recipe” cookbook. For the beans I used 1 cup kidney beans, 1 cup black beans and a can of the chili mix beans. I am serving this with garlic bread, but you can also serve this over rice. 1. Toast the cumin seeds in a large Dutch oven over medium heat, stirring constantly, until fragrant, 1 minute. Stir in the onion, bell pepper, garlic, chili powder, oil, cayenne, and 1/2 teaspoon salt. 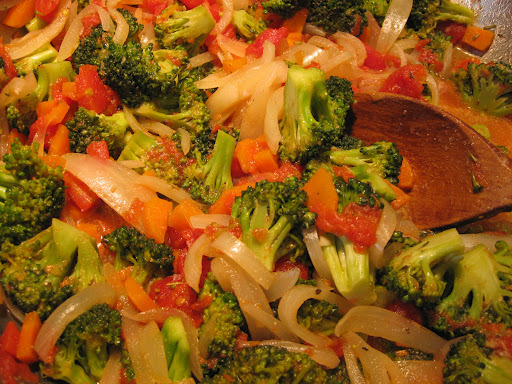 Cover and cook, stirring often, until the vegetables are softened, about 8 to 10 minutes. 2. Stir in the beans, water, tomatoes, oregano, and brown sugar, scraping up any brown bits. 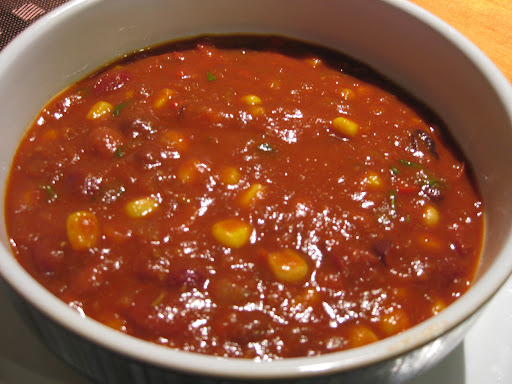 Bring to a boil over medium-high heat; reduce the heat to medium-low and simmer until the chili is slightly thickened, about 25 minutes. This recipe isn’t exactly healthy, but I only make it once or twice a year. I have never had the original Hy’s cheese toast, so I’m unsure if this recipe is close to it or not. This recipe came from the Winnipeg Free Press “Recipe Swap” section. The taste tester notes on the bottom of the page are from the person who wrote the column. I added them as I found the notes helpful. When I personally make this, I use Campbell’s cheddar cheese soup for the cheese sauce. 1. Slice bread lengthwise. Toast on both sides on your oven on broil. With a spatula, apply a thick layer of cheese sauce (you can use undiluted Campbell’s cheddar soup). Evenly cover this with a layer of Parmesan cheese. The butter should be sprinkled over the cheese with a pastry brush. Put back in oven until the Parmesan browns. Slice into pieces. Serve hot. Taste Tester Notes: Very cheesy, rich and good. The amounts of Parmesan and butter are generous, and once you start putting them on, you may want to use less according to your own discretion. If using canned soup, it comes in a 284ml (10oz) can, and you can get away with using this amount. This makes a lot of cheese bread, so depending on the number of people you are serving, you can make half recipe with one loaf of bread. 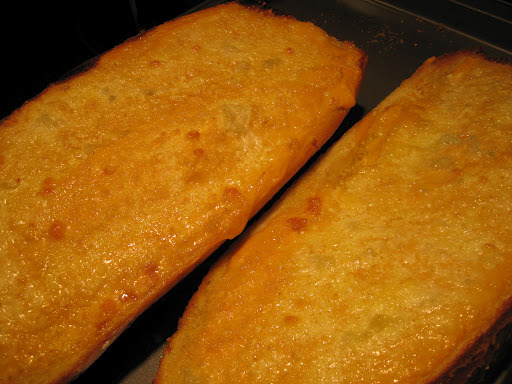 but if you have leftovers, I tried reheating slices of the leftover bread on a baking sheet in a toaster oven at 350F (about 10 minutes or until heated through and cheese starts to bubble) with good results.